This is a huge recipe (makes ~60-72 pierogies! ), adapted from Leanne Brown’s Good and Cheap cookbook. It’s a fun cooking activity to do with your family or friends. It takes time and effort, but the results are worth it. You can serve them fresh for dinner and throw the rest in bag or two for the freezer. Serve with some green beans, leafy greens, or your favorite vegetable. Put the chopped potatoes in a pot and cover with water, then add a bit of salt. Cover with a lid and bring to a boil over medium-high heat before removing the lid. Let the potatoes cook until tender, about 20 minutes. Test them with a fork: if it goes through easily, they’re done. Drain the potatoes and add shredded cheese, salt, pepper, and any additions you might enjoy. You should play around with some of your favorite things—there aren’t many flavors that don’t work in potatoes! Next, mash the potatoes with an electric mixer or just two forks. Once the filling is ready, gather some friends because shaping takes some time! Flour your countertop liberally. Split the dough in half. Keep one half covered, but place the other half on the floured surface. Use a rolling pin to flatten the dough, about ¼” thick. Punch out as many 3” to 4” dough circles as possible, using a round cookie cutter or a drinking glass. Squish the scraps into the remaining covered half of the dough. Drop about a tablespoon of filling in the center of one circle of dough. 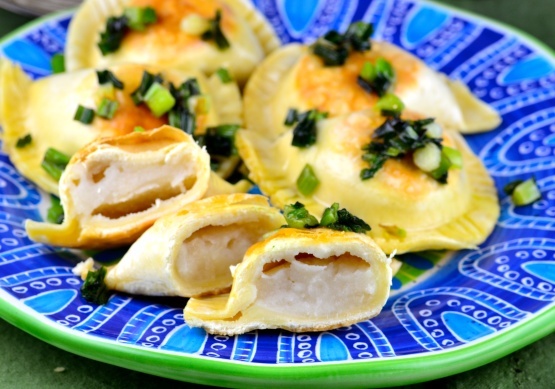 Fold the dough over the filling and press the edges to create a dumpling. The stickiness should ensure a tight seal. Lay the dumpling on a floured surface and use a fork to squish the edges together. Repeat until you run out of circles, then repeat everything with the remaining dough. Once you have all your perogies formed, boil a pot of water and add about 12 perogies. Let them cook until they rise to the top, about 1 minute. Pull out the boiled perogies with a spoon, then repeat with the remainder in the same pot of water. If you’re planning to freeze some of the pierogies, let them cool down and then put them in freezer bags with the air squeezed out. I usually do 12 to a bag, but you can portion them out in whatever way suits you. They will keep for at least 6 months in the freezer. You can eat the pierogies just boiled, but you can fry them afterwards. To fry: Melt a tablespoon of butter in a pan on medium heat, then fry up as many pierogies as you want. (Six per person is plenty.) Flip them every few minutes until they’re browned on all sides. Serve with scallions and a dollop of sour cream with some vegetables of your choice.